The Department of Culture, Heritage and the Gaeltacht is inviting submissions from individuals and organisations to assist it in the development of a new national Heritage Plan – Heritage Ireland 2030. The Heritage Ireland 2030 consultation documents sets out a framework under three themes, namely 1. National Leadership and Heritage, 2. Heritage Partnerships and 3.Communities and Heritage. Specific draft objectives are identified under each Theme, and following the consultation process an Action Plan will be drawn up to deliver on the agreed objectives. This consultation is an important process as it provides the opportunity to help shape Ireland’s heritage strategy for the next 10 years, and the rationale for increased funding to the Heritage sector under Project Ireland 2040. Since its establishment in 2007, the National Biodiversity Data Centre has developed into an essential component of the national heritage infrastructure to make information on Ireland’s biodiversity more accessible for decision-making, to assist engagement by both the public and private sectors with biodiversity and to support the conservation of biological diversity in Ireland. The Data Centre is at a critical stage in its development, with decisions soon to be made about its future, the best organisational model it should operate under, and the level of core funding that will be available to it to deliver on a work programme. Any national strategy for heritage must acknowledge the important role that the National Biodiversity Data Centre has to play in supporting Ireland’s natural heritage. 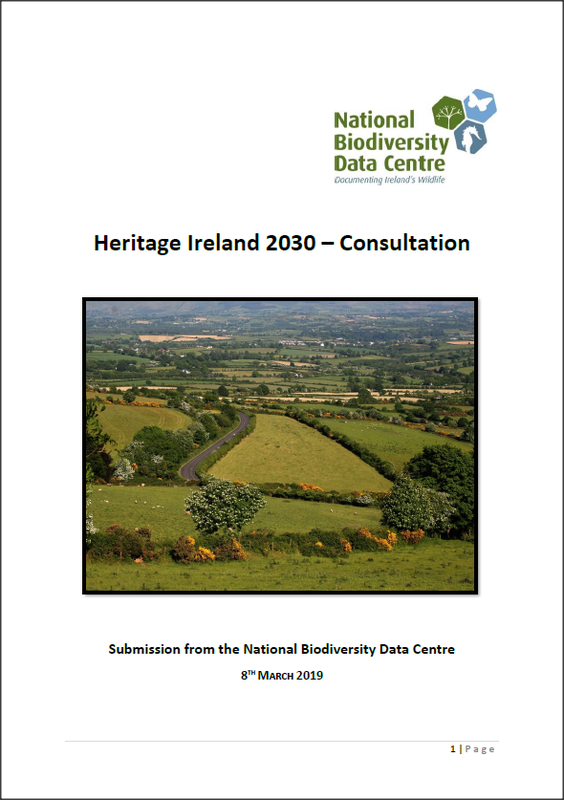 The submission from the National Biodiversity Data Centre on the Heritage Ireland 2030 consultation sets out how the Data Centre can assist the delivery of a modern strategy for Ireland’s national heritage. Download the National Biodiversity Data Centre’s – Submission on Heritage Ireland 2030.